As rush hour traffic crawled across Minneapolis&apos; Interstate 35-west bridge on a sultry August evening back in 2007, the roadway&apos;s central span suddenly gave way, plunging nearly 100 vehicles and 18 construction workers into the Mississippi or onto its banks. Although the emergency response was swift, 13 people died and 145 were injured. An exhaustive 16-month investigation (PDF here) by the National Transportation Safety Board found that the gusset plates — responsible for holding the bridge&apos;s joints together — were only half the thickness required to carry the structure&apos;s typical loads. Moreover, modifications from previous construction projects plus the weight of construction equipment and materials added a fatal strain on the 30-year-old bridge. But, says Jerry Lynch, a professor of civil and environmental engineering at the University of Michigan, "As unfortunate as that event is, it has called to attention the importance of infrastructure in the U.S. and the need to maintain it. This is not simply about safety. The economic prosperity of society depends on these systems." Just think about the impact the recent Bay Bridge closure could have on the San Francisco economy. In any case, Lynch believes the tragedy will ultimately inspire both government and the private sector to invest in additional and enhanced technologies to improve how bridges are designed and managed. He should know. Lynch is the lead investigator of a project exploring new technologies to enhance the field of structural health monitoring. With the exception of a few landmarks like San Francisco&apos;s Golden Gate and St. Louis&apos; Cape Girardeau bridges, the vast majority of the nation&apos;s spans currently lack any monitoring system. Funded in part by a nearly $9 million grant from the National Institute of Standards and Technology&apos;s Technology Innovation Program, what some are calling a "smart bridge" system will make it possible to detect problems before they occur by alerting inspectors to structural deficiencies through a wireless relay system connected to the Internet. And though the I-35 west bridge has since been rebuilt and now monitors everything from corrosion to temperature-induced structural changes, experts aren&apos;t drawing parallels between the collapse and tracking systems such as the smart bridges project. Catherine French, for example, a University of Minnesota professor and the principal investigator charged with monitoring the new bridge, readily admits there are limits to what health monitoring can do. Lynch says the I-35 disaster was extremely rare. "The far majority of collapses are caused by triggering events like earthquakes, scouring rivers or vehicular damage. You can&apos;t prevent an earthquake or a barge hitting a bridge." But for avoidable problems, Lynch&apos;s project, with its systems approach to structural health monitoring, cutting-edge materials and bridge health assessment tools, will improve both longevity and durability. Credit the Romans for first harnessing the compressional power of concrete, making possible the columns we commonly associate with classical architecture. Unfortunately, in strain-prone structures like bridges, concrete&apos;s brittleness can result in failure unless it&apos;s bolstered with steel. Enter ECC — engineered cementitious composite — a "bendable concrete" invented by one of Lynch&apos;s colleagues, Victor Li, a University of Michigan professor of civil and environmental engineering. "ECC is rather unique, because even without reinforcement, it can take a high amount of tension load unheard of in regular concrete," Lynch says. While it deteriorates like most cement-based material, cracks in ECC are just a few microns wide, compared with hundreds of microns for traditional cement. "When you have rain and de-icing salts on your bridges, you&apos;re allowing a lot of corrosive elements to penetrate into your buried steel. ECC is therefore more resilient against corrosion of any steel that might be buried inside." Beyond its mechanical attributes, ECC can even quantify how its electrical properties change in response to how much strain the bridge is experiencing at a given moment. "Using a standard volt meter you get at Radio Shack, I could tell you how much strain&apos;s in that material just by measuring its resistance," Lynch says. This "self-sensing" can reduce both cost and complexity of instrumentation. Similarly, Lynch and his team are working on a spray-on sensing skin that can be painted or glued onto particularly vulnerable surfaces to measure both strain and the existence, location and severity of cracks. Using carbon nanotubes (think slender, spaghetti-like molecular structures), the stuff works like a distributed sensor. "We can use this material to see how its electrical properties change under both load and chemical changes like the pH environment, which is intrinsically linked to corrosion." The "sensing skin" will not only cover a much higher surface area (and thus eliminate the need for dense arrays of physical instruments) than traditional monitoring devices, it&apos;ll provide actual color-coded pictures, making it easier for analysts to address problems. Up to now, one of the biggest challenges in getting cities and municipalities to incorporate health-monitoring systems has been the expense. Part of this can be traced to the current methods for communicating data, which typically involves the use of costly cables to transfer sensor readouts to a computer that&apos;s storing the information. By going wireless, communication between the sensors themselves as well as between a sensor and a centralized data repository not only eliminates the need for cables, but allows data processing directly at the sensor. "We can avoid inundating the bridge owner with truckloads of raw data and just provide information they can act on," Lynch says. Complementing site-based monitoring, a fourth kind of sensor would be placed within test vehicles (probably driven by bridge owners) to measure the bridge&apos;s reaction to the strain imposed by the car or truck. According to Lynch, there has yet to be an effective way to monitor how vehicle behavior directly impacts bridges. However, vehicle-equipped sensors will help engineers and analysts predict how long a given structure will last and play a role in improving future sensor systems as well as bridge design. Over the next five years, Lynch&apos;s team will be testing out these innovations on a handful of small- to mid-scale bridges in Michigan and possibly a large suspension bridge, the recently built New Carquinez Bridge, an hour north of San Francisco. When complete, the system will, for the first time, offer engineers and bridge operators a way to see with their own eyes just where the problems are. Commuters, though, won&apos;t be aware of these advances — "unless they looked really hard," Lynch says. "You don&apos;t want vandals vandalizing your system." How Exactly Does a Bridge Collapse? 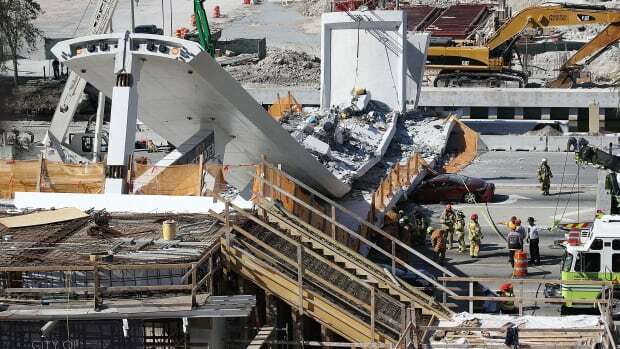 A forensic engineer describes the process of investigating a bridge collapse, like the recent one that occurred at Florida International University in Miami.